Only five out of 19 major commercial tuna stocks are being managed to avoid overfishing and restore depleted fish populations — and have earned a passing score for Marine Stewardship Council (MSC) Principle 1 — according to independent scientists in a report published by the International Seafood Sustainability Foundation (ISSF). ISSF 2019-02: An Evaluation of the Sustainability of Global Tuna Stocks Relative to Marine Stewardship Council Criteria attributes this failure to poor stock status, the lack of well-defined harvest control rules (HCRs), and the lack of effective tools to control harvest. Only three of the stocks have well-defined harvest control rules from Regional Fisheries Management Organizations (RFMOs), which continue progressing slowly in this area. The January 2018 version of the report had found that six out of 19 stocks were being managed to avoid overfishing, meaning the situation has not improved in the last year. While South Pacific albacore Principle 1 score has improved thanks to further progress by WCPFC on this stock’s harvest strategy workplan, two other stocks have seen their overall Principle 1 scores worsen: eastern Pacific bigeye due mostly to uncertainties in its latest stock assessment, and Atlantic yellowfin tuna due to weak tools in place to control exploitation that may be hindering its rebuilding plan. An Evaluation of the Sustainability of Global Tuna Stocks takes a consistent, comprehensive approach to scoring tuna stocks against certain components of the Marine Stewardship Council (MSC) standard. The MSC is a global certification program for fisheries. Provide a basis for comparing between stock scores and tuna RFMO scores as assessed by the same experts. Become a useful source document for future tuna certifications or in the establishment of tuna Fishery Improvement Projects (FIPs). Prioritize ISSF projects and advocacy efforts against initiatives that will improve low performance indicator scores. The scores in the report focus on stock status (MSC Principle 1) and the international management aspects relevant to RFMOs (part of MSC Principle 3) and are based on publicly available fishery and RFMO data. Each of these Principles is evaluated in relationship to Performance Indicators (PIs) within each Principle. The Evaluation report also includes detailed remarks on each stock, evaluations of the four RFMOs, and comprehensive reference citations. The report does not address bluefin tuna stocks. Among seven tuna stocks in the Atlantic Ocean, one received an overall principle-level passing score: Northern albacore. 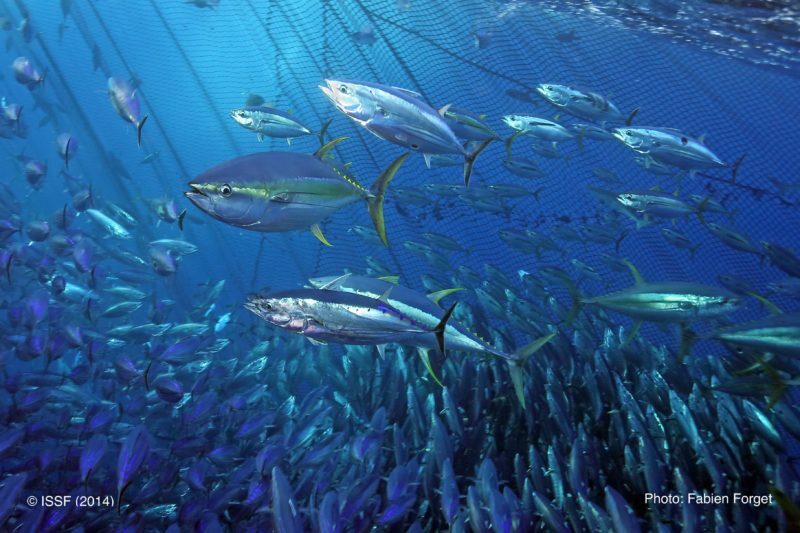 Among eight tuna stocks in the Pacific Ocean, three received overall principle-level passing scores: Western skipjack, Eastern yellowfin and Southern albacore. Among four stocks in the Indian Ocean, one received an overall principle-level passing score: skipjack. In the Pacific, five stocks received overall principle-level failing scores: Western yellowfin, Northern albacore, Eastern bigeye, Eastern skipjack and Western bigeye. In the Indian Ocean, yellowfin, bigeye and albacore all received overall principle-level failing scores. In the Atlantic, yellowfin, bigeye, Western skipjack, Eastern skipjack, Southern albacore and Mediterranean albacore all received principle-level failing scores. Stocks that require rebuilding include Atlantic yellowfin, Atlantic bigeye and Indian Ocean yellowfin. See a graphic showing MSC Principle 1 averages from February 2013-January 2019. One RFMO —IATTC — received passing scores for all seven performance indicators under Principle 3. See a graphic showing MSC Principle 3 averages from December 2013-January 2019.